The topic of today discussion is endgames. I know most chess players don’t like studying endgames. They spend all their dedicated chess time memorizing 10th and 11th moves of one of the lines in Closed Sicilian or some other opening.Then, after losing the game, after game after game, they are very disappointed and say something like ‘Why do I lose? I spend so much time studying chess!’ If only they spend 25% of the time they spend ‘studying’ openings to understand simple endgames they would’ve been so much better chess players… 200 points better or maybe even 400? What’s so important about endgames is that they teach fundamentals of cooperation between pieces and pawns. 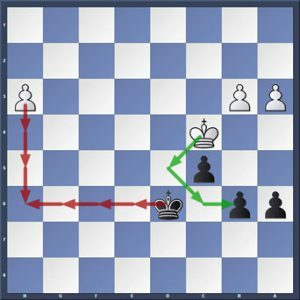 By studying endgames first and only then middlegames and openings your training will be much more efficient and effective. You will understand what endgame is winning and which one isn’t, you will also understand when and what pieces to trade in the middle game to achieve a favorable ending. Only after understanding endgames and middle-games well, it makes sense to study openings, since you already will know what type of middlegame and endgame you want to aim for. Today’s discussion will be solely about endgames and about a few tricky critical positions that any chess player should know how to play. Many chess players have difficult times figuring out if they can catch a passed pawn with their King, or it will promote. Sometimes they need to make even more complex decisions, for example, concentrate on catching the passed pawn or promoting their own pawn. A mistake in this type of position usually cost the whole game. 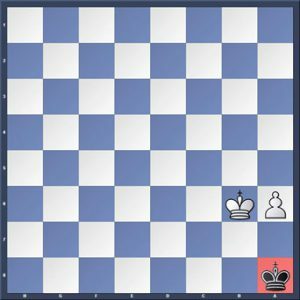 How do we decide if the passed pawns can be intercepted by the King or not? Do we need to calculate move-by-move? But what if it’s a blitz game or you’re short on time? 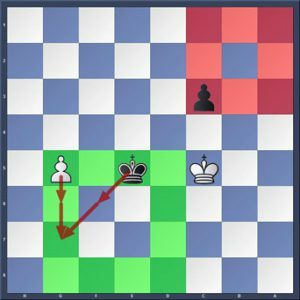 In reality, there is a simple rule that allows checking if the king can actually catch the passed pawn. It’s called ‘Square Rule’. 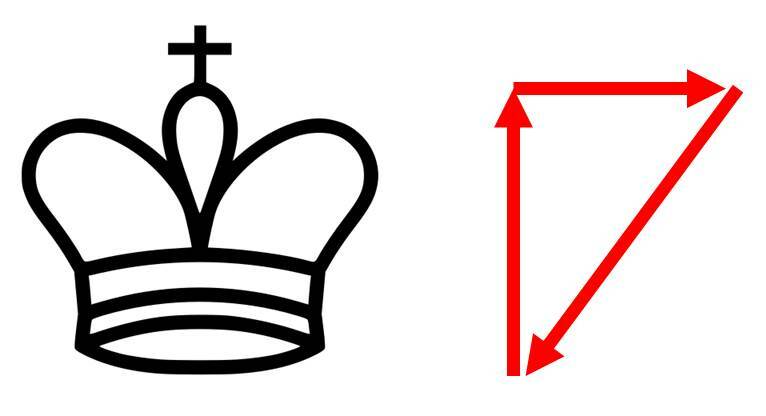 The rule states that if the king is inside the square of the pawn it will catch it. Black king can easily catch the white pawn since he is inside the green square. However, white king cannot catch black’s passed pawn since he is outside the red square. Single passed pawn located on the opposite side of the board from the kings gives a huge advantage to the side in possession. The main purpose of the isolated passed pawn is to attract the attention of the opponent’s king so that it leaves its defensive grounds and goes for the isolated pawn, leaving other pawns unprotected. The other king can then penetrate the pawns and win the game easily. 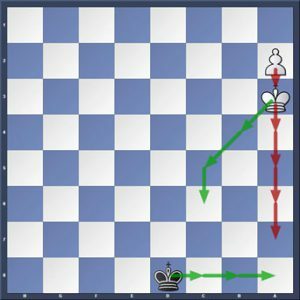 Two connected passed pawn are a powerful weapon in the king and pawn endings. The main power of these pawns is that neither can be captured by a king due to the threat of promotion of the other one. In the example below black king is stuck guarding white’s pawn pair. 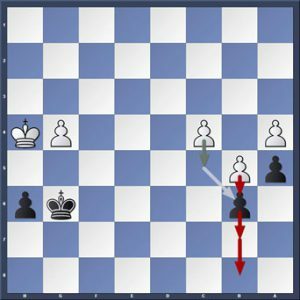 At the same time, white king can penetrate black pawns and capture them all. 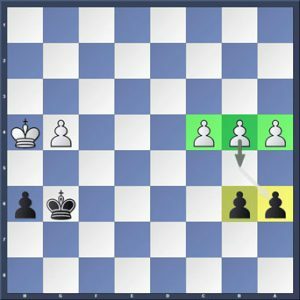 Pawn majority is also a valuable resource in king and pawn endgame. 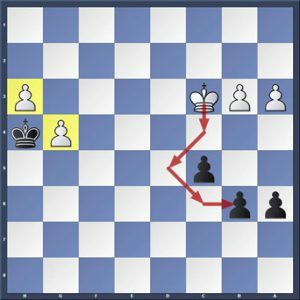 The main idea here is to sacrifice a pawn and to create a passer, which then promotes to a Queen and recaptures all other pawns and/or mates the king. In position 1 below white pushes its pawn to b5. Black avoids capturing and plays a4. White then plays c4-c5, sacrificing the c-pawn and promoting the b-pawn, winning the game (position 2). Sometimes things in endgame do not go as well as we would like them to be and we need to save the game by using tricks. This simple, though powerful trick may help you save not one game when you playing a pawn down. 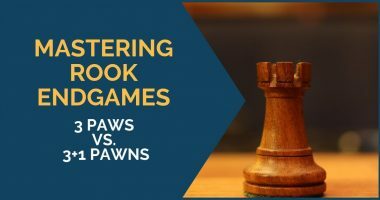 The idea is that your opponent has one of the rook pawns and wants to promote it and win the game. Our defensive strategy here is simple. We must occupy the promotion square (corner of the chess board) in order to draw the game. Your king cannot be driven from there by force. In example 3 I don’t see why the black king cannot take out those two pawns. If white moves the g pawn black then takes it. Blck then easily finishes off the h pawn. If the pawns just sit there while white moves other pieces elsewhere, then black king takes the h pawn, then easily catches the g pawn. Am I wrong? Yeah, you’re wrong. If black king takes the ‘backwards’ pawn, then he cannot catch the ‘forwards’ pawn in time, and white gets a queen. Keep оn writinɡ, great job!